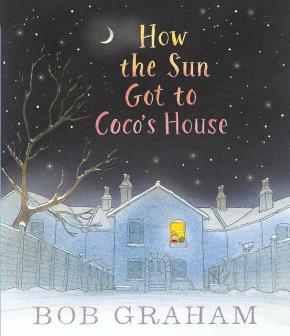 From prolific and multi-award winning writer and illustrator Bob Graham comes an enchanting story about the sun, and how it makes its journey from the far side of the world to the home of one small girl. The sun rises up behind a snowy peak and casts its mellow dawn light for the wandering polar bears. It skims across the icy water, touching a fisherman's hat and catching for a moment in the eye of a whale. It beams through the trees of frozen forests and makes shadows in a little girl's footsteps before gliding over cities, darting down lanes and waiting patiently for an old lady to open her window. The sun races through the countryside, greeting snow cats and bears. High over a desert it meets the rain in a halo of colours... The sun leaps whole countries, chasing the night, before bursting at last in a fanfare of warm golden light through Coco's window!